The rail connectivity to the city is through twin track railway lines from Delhi and Mumbai upto Ambala , a single track broad gauge thereafter upto Kalka and a narrow-gauge single track between Kalka and Shimla having heritage value. The recently built single track Chandigarh to Morinda railway line provides rail connectivity to Punjab. Besides serving the city, Chandigarh‘s railway station located in the north-eastern periphery of the city near the Industrial Area also serves the goods and the passenger traffic of the neighboring region including the towns of Panchkula and Mohali. 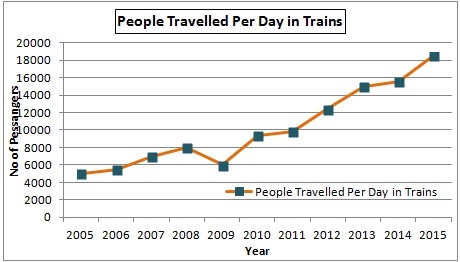 With the increase in the frequency, number & comfort of trains, rail has become an important mode of transport. Source: Station Suptd. Northern Railway Chandigarh.